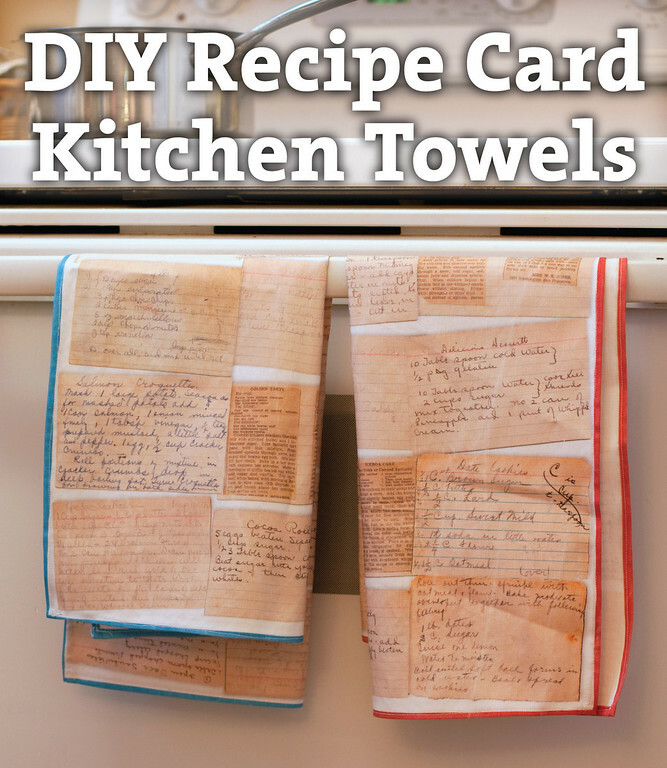 Recipe Card Kitchen Towels Mama Say What?! | Mama Say What?! Recipe cards are pretty much a thing of the past these days… with the ease of finding recipes on the internet and sharing them through blogs and websites like Pinterest, it’s no wonder we don’t spend the time to hand-write a recipe for someone anymore— I know I don’t. I have a folder on my computer just for recipes I have received from my mom and grandmother. For many of them, I typed them out after borrowing the hand-written card. 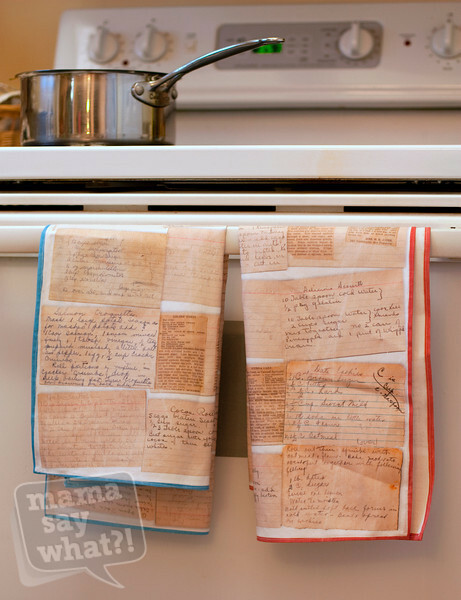 While cruising Pinterest one day, I ran across a pin from SpoonFlower’s blog where the designer, Emma Jeffery, took photos of her grandmother’s hand-written recipe cards and had some fabric custom-printed using SpoonFlower. She then cut out the pieces and sewed a hem around the edges. 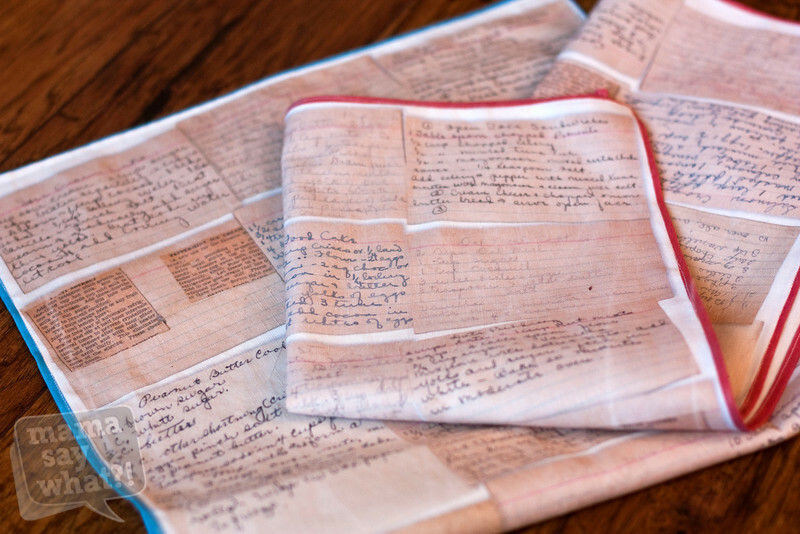 The result was a wonderful heirloom of her grandmother’s handwriting and a great set of tea towels for her kitchen. She made some for her mama as well. 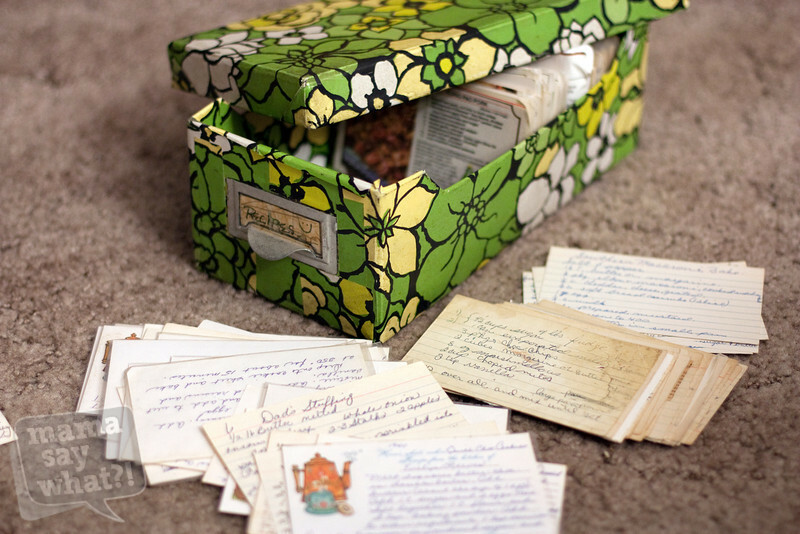 It was so inspired by this idea that I set out in search of my mom’s recipe box. It took me a while to find it, but I immediately recognized its 1960s-yellow-and-green-floral-contact-paper cover. This worn box has been stored in different parts of my mom’s kitchen for the entirety of my memory… crammed full of recipes from my mom, grandmother, great-grandmother, aunts, recipe books, magazines and other various family members. I even found a coupon for 50 cents off a can of green chiles that expired in 1989. I riffled through the cards in search of ones that were handwritten by my grandmother and my great-grandmother. 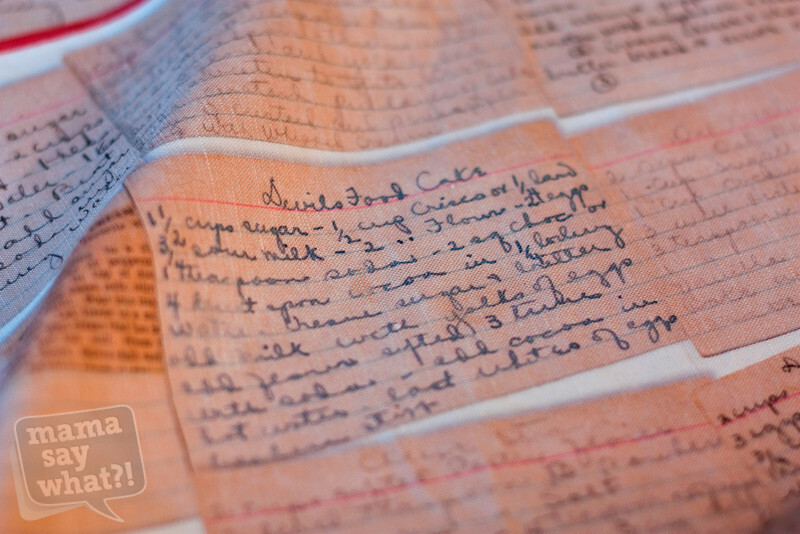 When my great-grandmother died, (shortly after I was born) my mom got her box of recipes. I was able to quickly identify her handwriting and discern it from my mom’s. 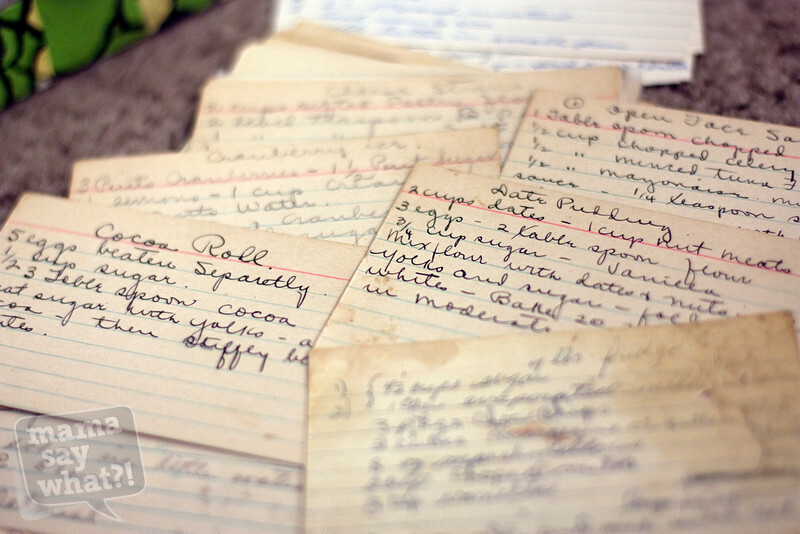 My grandmother’s handwriting I already knew, but I only found two recipe cards handwritten by her. My mom told me she preferred to use the typewriter for her recipe cards— Bummer. I borrowed a bunch of recipe cards handwritten by my mom as well, recipes she got from my dad’s mom and other various family members over the years. I also grabbed some recipes that I actually wanted to try so my mom didn’t get any ideas about what I was planning. Once I got home, I scanned all of the recipe cards that my great-grandmother wrote out and set about arranging them in a nice-looking collage. 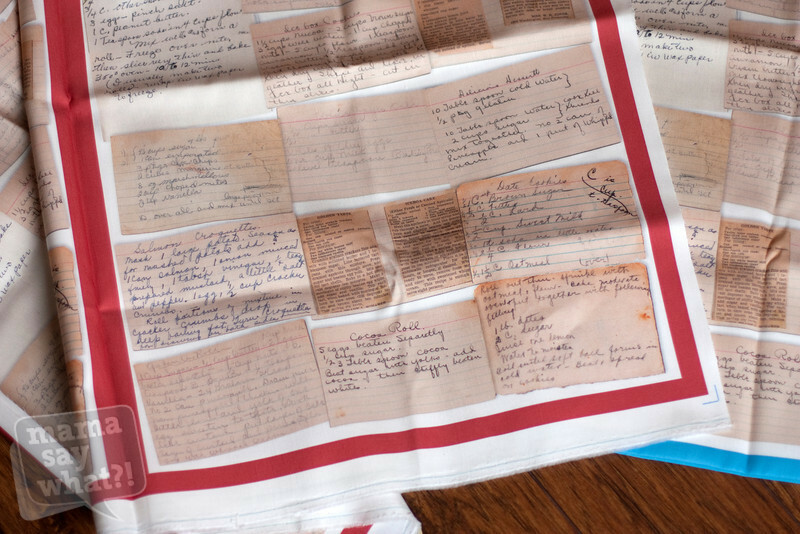 I included three recipe cards that just had recipes that she had clipped from her newspaper. I liked the charm they added to the designs since I know she used to adhere recipes from the newspaper onto her 3.5″ x 5″ cards with rubber cement so they would fit into her recipe box and not get lost. I used Adobe Photoshop to delete the white backgrounds on each card and adjust color and contrast to my liking. I didn’t want to eliminate the aged look of the cards or the worn edges, though. I also didn’t want to over-sharpen the cards that were written in faded pencil. Then I dragged all of them into Adobe Illustrator and set up the file to one quarter the size of the full-yard of linen-cotton canvas that SpoonFlower sells. This can easily be done all in Photoshop, I’m just more versed in Illustrator. This can also be done in other programs like Photoshop Elements, Publisher, PowerPoint or online using Picasa or Gimp. I bet you could even do this on a PC using Paint. I gave some of the towels a blue edge and some a red edge. I chose colors that I knew coordinated with the kitchens of my mom and my aunt; the people who would be receiving these as Christmas gifts. 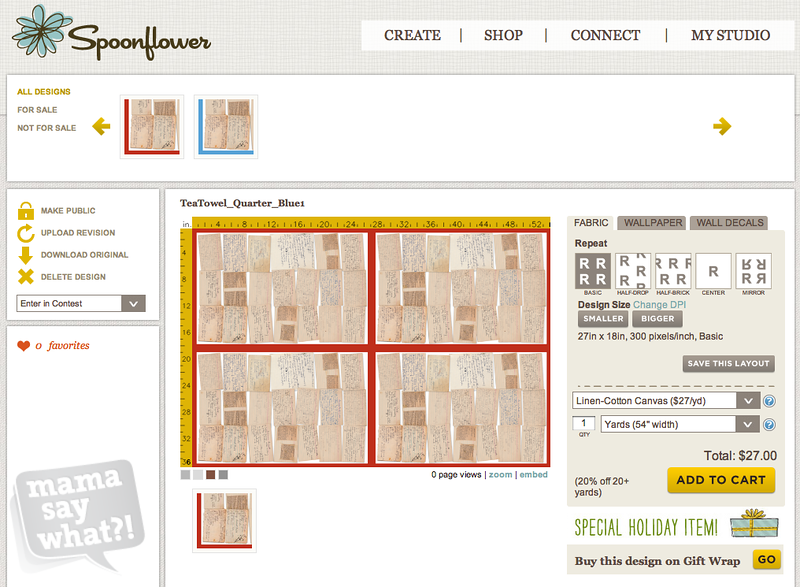 Once my file was uploaded onto SpoonFlower’s website, I set it up to be tiled so four towels fit on one panel of fabric. I felt like being a rebel and went ahead and placed my order without ordering a small fabric swatch first. If I had started this project a month or two earlier, I would have ordered the swatch first to make sure I liked how the colors printed on the cotton canvas. In about a week and a half, my fabric arrived and I was SO excited to see it! The print quality was really wonderful; much better than I was expecting. After running the fabric through the washing machine and dryer, I saw a little bit of fading, but it only added an “aged” look to the colored edges and enhanced the overall look of the fabric… at least it did in my opinion. Either way, I was very impressed with the print quality. Next I ironed the fabric and trimmed each of the towels. With my iron, I creased a rolled hem around the edges. 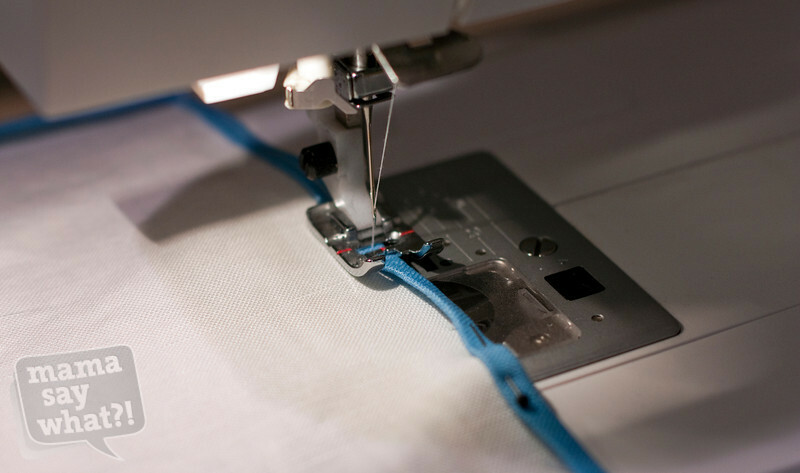 Then I did a simple stitch all the way around with my sewing machine. To finish the Christmas gifts, I gave two towels each to my mom, aunt, sister and cousin along with one of my favorite cookbooks. I’m going to talk to my grandmother on my dad’s side of the family and see if I can find her box of recipes and see what cards I can find— hopefully something from her own mother or more handwritten cards from her. I’d like to have some towels printed for myself too. I realize this gift idea was published AFTER Christmas, but many of my family members read Mama Say What?! and I didn’t want their Christmas gifts spoiled. These would make an amazing mother’s day or father’s day gift too! The best part of this heirloom— if the towels get worn out, I can always have more printed! Added by Alex T. on January 12, 2013. These are so RAD! Makes me want to go through all of my grandma’s and do this too. I seriously love these too! No one in my family has ever kept recipe cards, unfortunately. But these are such an awesome keepsake and so cool looking. This is such a beautiful idea! Plus, it would make such a special gift. What a great way to feel close to far-away family. Thanks for sharing! Pingback: Go-To-Gifts: Mother's Day and Giveaway! Mama Say What?! | Mama Say What?! What an awesome idea! I probably need to organize my recipes in general before I tackle something like this, but maybe I just found my motivation! Hi! Quick question, I’m trying to do this right now, and Spoonflower keeps making my images so small… I don’t know how to get them any bigger? Hi Amanda! Thanks for the comment! What size are you going for? The same tiled look I did with 4 towels per yard of fabric? If so, is your image set to be 27″x18″ and a resolution of 300dpi? If it’s smaller, then you’ll need to adjust it on your computer before uploading it to SpoonFlower. If it is the correct size, can you adjust the sizing by using the “bigger” button that is located under the words “Design Size”? Pingback: Handmade Holidays Nov. 28: Gifts for Grandparents | Sew Mama Sew | Outstanding sewing, quilting, and needlework tutorials since 2005. This is such an amazing idea. I hope to be able to figure out how to use Illustrator or any of the programs in order to input this. This would mean so much to my mom. They are gorgeous. Thank you for sharing the idea and your process! This is so nice. My cousin had one of my mother’s favorite recipes copied and matted and framed. It was so nice. This would also be a wonderful special gift. I can’t find this fabric on Spoonflower. Can you help? Hi Susan! This was custom fabric that I designed myself. I didn’t upload it onto SpoonFlower for the public to be able to order too. And so far as I can see, the linen-cotton canvas fabric is still available to print custom artwork on. Thanks!! Sounds complicated to me. Couldn’t you use photocopy on to the transfer paper they have these days? Iron it on and be all done? Hi Diane, thanks for the comment! The iron-on transfer paper wouldn’t work so well because then the fabric wouldn’t be absorbent on both sides and be a functioning kitchen towel. Also, with wear and washing, the iron-on transfers start to peel off. 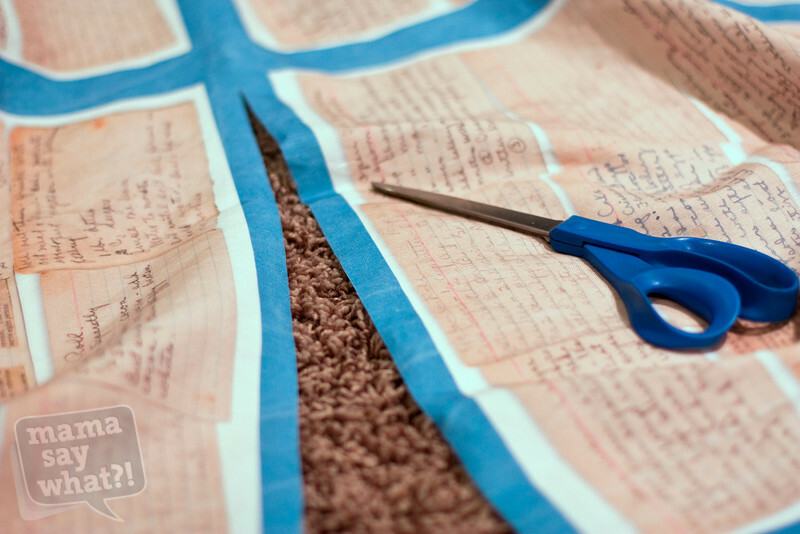 SpoonFlower prints right onto the fabric, so it’s durable and sturdy. If you planned to use the towels only for decoration, then the iron-on would totally work. Were you happy with the fabric choice for the towels?….the linen cotton canvas? Yes! The fabric has held up wonderfully. Thanks! I, too, was so pleased with how the fabric from Spoonflower came out. It was easy to do and I’m sure these towels will be cherished for years to come. Thanks for the terrific idea!! I love these would you be willing to make them for me.? Was wondering if you would make some for me? I desperately want this to give to my Sister’s this Christmas, but I am not computer/printer literate. I would love to find someone to do it for me. I’ve seen lots of people on etsy who do one recipe, but I love the way you did in with lots of recipe cards.